State Capitalism, National Socialism, think Mussolini and Hitler. And then remember the USA press thought Mussolini had it exactly right. 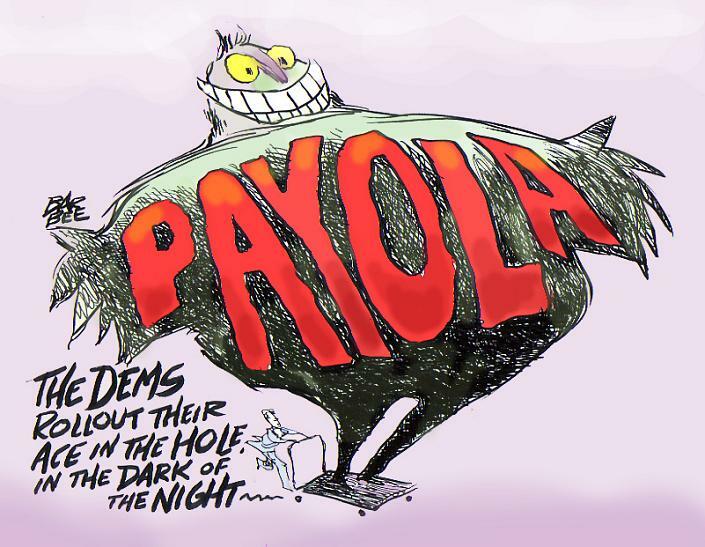 Democrats rigging the votes, buying the votes, rigging the legislative game. It’s what Democrats have been doing to the last four years. The Progressives of America have been in love with National Socialism for near 100 years. NAZIs. What’s with this guys arrogance, does he think he was elected king? No not really, Obama is nothing more than a socialist ideologue of the worst kind. Sort of like a large scale Hugo Chavez Socialist. Obama lied to the American people to get elected, now he is weildeding the American political system like a weapon against it’s people. And he thinks no one notices … HAHA, that’s funny. And now Obama has the audacity to say he and his agenda is not socialists. I assume if he were talking to Kenyans, they would not have the mental dexterity to figure it out. But in America we know a socialist ideologue when we see one and it sure isn’t pretty. Well let’s look at his alleged father, a self avowed Communist. His father was thrown out of the Kenyan government because his Communism was too extreme for even the Kenyan government. He made a radical, socialized medicine, health care bill the center piece of his legislative agenda in 2009, even though unemployment had reached a high we have not seen in a quarter of century — And Obama Rejects Cries of ‘Socialism’… Well so what …. President Barack Obama launched a vigorous defense of his economic agenda Wednesday, rejecting critics who call his policies “socialism” and insisting he aims to boost U.S. competitiveness abroad. So let’s just call Obama Socialism, Obammunism. That better? Yeah, well so what, he says he isn’t a socialist, you notice he says a lot of things that aren’t true, like all socialists do. We see what we see and what we see standing before us is a Socialist. Socialims is a big lie itself, and as Margret Thatcher once said – “The trouble with Socialism is that eventually you run out of other people’s money” — Margaret Thatcher — Which is exactly what is happening right now in America. And further she said – “Socialist governments traditionally do make a financial mess“— Margaret Thatcher. And contrast the mess Socialist Obama has made for America in the pursuit of his socialist agenda. Next time study the character of the President you wish to elect, it will save you a whole lot of grief later. Finally, we came across the following list over the weekend as we were going through e-mails and cleaning things up. We checked out the data, and it is correct, so the “correlation” seems reasonably to hold. 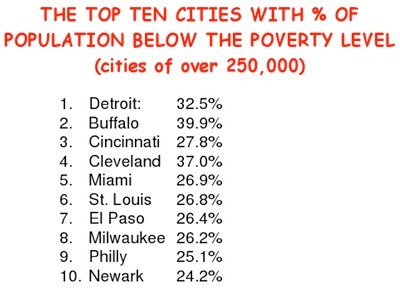 Now, what do all of these cities have in common beyond their egregious poverty level rates? They all have had since 1989 and continue to have, Democrat Party mayors… with Cleveland having had the Democrat mayor incumbent for the shortest period, since 1989, while Newark and Milwaukee now go back for nearly one hundred years of Democrat “rule.” Detroit, with the highest poverty rate has had a Democrat running the city government since 1961. Not casting aspersions here; simply drawing correlations. You can draw your own conclusions. You are currently browsing the archives for the Democrat's Socialism category.